Save time and money with the TR-1-NK-HE digital scale for use on forklifts, front end loaders, tractors, skid steers, etc. No more driving back and forth to a floor scale, weigh on the go and save time! With many features including "Lock-on-weight" and weight totalization, this unit provides safe weighing at a fraction of the cost of other manufactures. This scale provides a quick weight check with easy installation and a user friendly interface. This hydraulic scale system is supplied with a 5000 psi (temperature compensated) sensor and 12 feet of hook-up cable to the digital display. Add an on board thermal printer, label printer, or wireless printer to capture load totals. Want to monitor load weight? We now offer a load monitor, all-in-one display, that gives the operator a secondary display showing load information for easier loading to target values. Attach to any type of hydraulic lifting systems to view the weight of the load being lifted. Accuracy error 1-2% of lifts capacity. Use on forklifts, loaders, and similar machines. Quick and easy weight check for shipping, receiving, inventory verification, etc. The scales capacity has no limit and will be the same as the machines maximum capacity. Graduation: 10 lbs. up to 10,000 lbs; 50 lbs. over 10,000 lbs. Use on gas or Electric forklifts. Weight TOTALIZATION feature allows for accumulation when loading or unloading. Display modes for "Lock-on-Weight" or "Static weight". Adjustable motion detection and threshold for "Lock-on-Weight". Reweigh button for "Lock-on-Weight" without reloading the scale. Water-resistant corrosion proof enclosure with stainless steel adjustable stand/mount. Each weight can be stored and totaled. High efficient super bright LED 6 digits .56" high. Enclosure ABS sealed 6.5" by 3.5" by 2.25" (without stand). Data output for optional printer or computer. The standard features provide for easy setup and calibration and a simple interface to optional printers or computers. Ability to weigh while loading eliminates time wasted using a stationary scale. Installation of the (TR-1-NK-HE) digital scale is easy and consists of mounting the display in a convenient location, teeing in the pressure sensor, and attaching the power cord to the vehicle battery. The display is mounted for easy viewing and operation without interfering with the operators view. It gives the operator a quick check for unsafe overloads. The unit has adjustable parameters for automatic weight capture and capture and add for front-end-loaders. 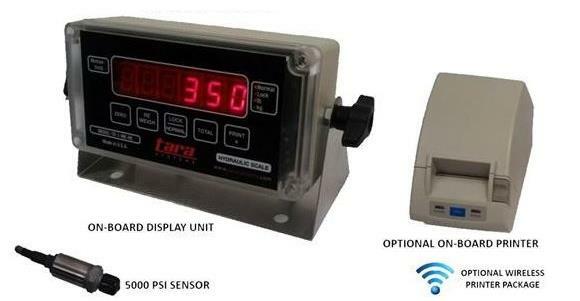 Display modes for display of Current Load or Total Weight, overload warning, and a super bright LED display. Add a roll receipt printer to print each load and the load total. For printing labels, use our label printer for printing stick-on labels with large print characters and/or bar code information.